The cloud? There really is no such thing. There is the public cloud, the private cloud, the hybrid cloud. The Google Cloud, the IBM Cloud, Amazon Web Services (AWS) and many more. All of these are cloud platforms that perform many different functions, from AI to web apps. Microsoft Azure, for example, offers more than 100 different services – and counting. What is colloquially referred to as “the cloud”, is more accurately called cloud computing and is all about providing services and required IT resources on demand via the internet. The cloud services most commonly used by businesses are Software-as-a-Service (SaaS), Infrastructure-as-a-Service (IaaS) and Platform-as-a-Service (PaaS). Generally, outsourcing to the cloud means software is no longer installed locally on individual computers but is executed completely via the internet. A private (or corporate) cloud, as the name suggests, is restricted for use to one organization, which is hosting it in its own data center, an external data center or is renting it from a cloud provider. Hosting a cloud on premises obviously requires the relevant hardware. The public cloud, in contrast, is hosted by a cloud provider and can be rented by everyone. It is a pay-per-use service, meaning users only pay for their actual consumption. SaaS programs, Microsoft Dynamics 365 for example, are hosted in public clouds (in this case, Azure). A hybrid cloud is a mixture of both private and public, where the organization decides which services are to be moved to the public cloud and which should be hosted in a private cloud. Nothing facilitates a decision quite like raw numbers. And the numbers for cloud computing are indisputable. The cloud saves IT departments a great deal of money. Expenditures for servers and costly software packages are obsolete. With Saas, IaaS and PaaS, instead of buying software, infrastructure or a platform, a business rents it on a monthly basis – a fact sure to delight the accounting department. If at the end of the month your requirements have changed, you simply add or cancel licenses. This way you only pay for what you really need. With cloud-based software like Office 365, employees can work and collaborate productively wherever they are and on whichever device they are working. Since it allows them to access information, applications and storage space from anywhere at any time. Cloud environments are also fertile ground for innovation. New ideas, such as new business applications, can be realized much more quickly and at much lower cost. And if one does not pan out – no worries, it is not like a large investment has been made in vain. Ironically, security concerns are the main reason companies hesitate to move to the cloud. Fears about data integrity, however, are more than outdated. In a time when hacking and other cyber crimes are commonplace, the evergreening of security features of cloud platforms and services is a vital protection mechanism. It should also be noted that major corporations like Microsoft or Amazon can provide much better physical security of their data centers than most businesses have the resources to do on their own premises. When choosing a provider, certificates such as ISO/IEC norms 27001 (Security Management) and 90001 (Quality Management) are signs of quality. As mentioned above, by moving to the (public) cloud internal data centers, server rooms, and some hardware become obsolete. This also eliminates the need for their acquisition, installation and general upkeep, freeing IT departments up to focus on less arduous, more productive tasks. Cloud computing also simplifies IT administration. This is a boon for smaller companies that already struggle to recruit IT professionals. Here is another plus: Modern technology helps attract millennial talent. Generation Y is eager to work with the latest software, explore all its possibilities and turn ideas into innovation. Cloud migration projects are often costly, lengthy and complex. They require a set of skills not usually found in most companies. Therefore, it is advisable to work with an experienced migration partner from the get-go. Collaborating with the IT and other stakeholder departments, it helps figure out the right strategy for a company. This includes which deployment option is most suited, where to start and how to integrate existing systems. 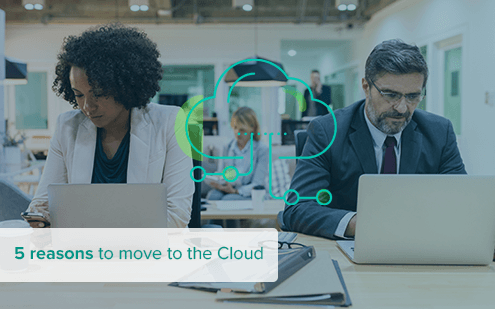 Additionally, a partner can also be of assistance once the move to the cloud has been made by training employees and providing technical support. When looking for an outsourcing partner, businesses should pay attention to its experience in a given industry and market segment. Customer references are also helpful in deciding whether a partner is a good fit. There is no digital transformation without the cloud. Cloud computing is the basis for those technologies that hold the biggest innovation potential for businesses: IoT, Machine Learning and AI. Businesses that want to stay competitive in the digital area depend on the key benefits of cloud computing: agility, flexibility and innovation. Get in touch with us today to discuss your move to the cloud!